Regarded as the first-ever football card set, 1894 Mayo Cut Plug Football (also called N302) is a hobby classic. 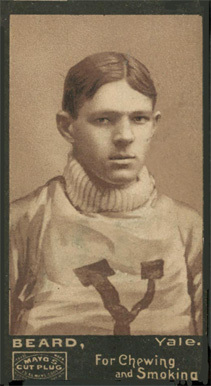 The 35-card set features players wearing college clothing from Harvard, Princeton and Yale. Measuring 1 5/8" x 2 7/8", the mini tobacco cards come with a simple black-bordered design. The player photos are done with a sepia tone. Underneath are the player's last name, school, an ad for P.H. Mayo tobacco and the slogan, "For Chewing and Smoking." The cards are not numbered and have a plain black back. Today, even the most well-loved and beat up cards still sell for hundreds of dollars. 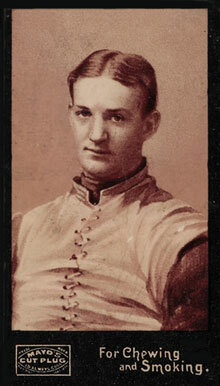 John Dunlop (who is not named on the front and is sometimes referred to as "Anonymous") is the rarest card in the set. It's considered by most to be the T206 Honus Wagner of football cards, the Holy Grail against which all other football cards are measured. Approximately ten copies of the card are thought to exist. A Michigan couple recently found a copy of the 1894 Mayo Cut Plug Football card while cleaning out their farmhouse. Estimates suggest that the card could fetch up to $60,000 when it hits the auction block in May. Another interesting card in the set is Poe. 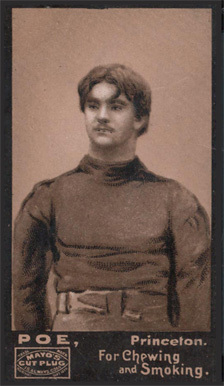 The player is believed to be Neilson Poe, who was related to writer Edgar Allan Poe. Neilson's father was the macabre poet's nephew. A testament to the set's condition sensitivity, according to the PSA Population Report, the highest grade a card from 1894 Mayo Cut Plug Football has received is a NM-MT 8. Even then, just a handful have received such a grade. Black borders are tough on cards, even modern ones. 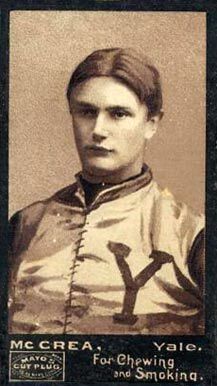 In recent years, a couple of releases have paid tribute to 1894 Mayo Cut Plug Football. 2002 Gridiron Kings had an insert set called Donruss 1894. Each of the 25 cards were numbered to 1000. Players are featured with a photo-realistic black and white drawing. 2008 Topps Mayo brought the classic look back for a full set. A popular set with many collectors, it was followed up in 2009. Vintage 1894 Mayo's Cut Plug N302 Phillip Stillman football card - Yale - SGC 3!